I was at the BBC College of Journalism in Bristol recently where I was participating in a CIRCOM Training the Trainers course. As part of it I had to deliver a complete training session to a group of 11 people who work in media organisations across Europe, the challenge … it had to be done in 30 minutes. In the past I’ve trained people mostly in social media and web publishing and for people with limited skills in these areas you need more than 30 minutes to get up and running on most platforms. It’s a good challenge to see what skills you can transfer in just 30 minutes. I decided to train the group on Snapchat Stories. For the unfamiliar, Snapchat is a photo messaging app especially popular with people under 23 years of age. Users send each other ‘snaps’ (photos or short video clips) either to one or multiple recipients. The photo or video clip can only be viewed for ten seconds or under, the duration is set by the sender, before it is deleted both from the recipient’s phone and Snapchat’s servers. 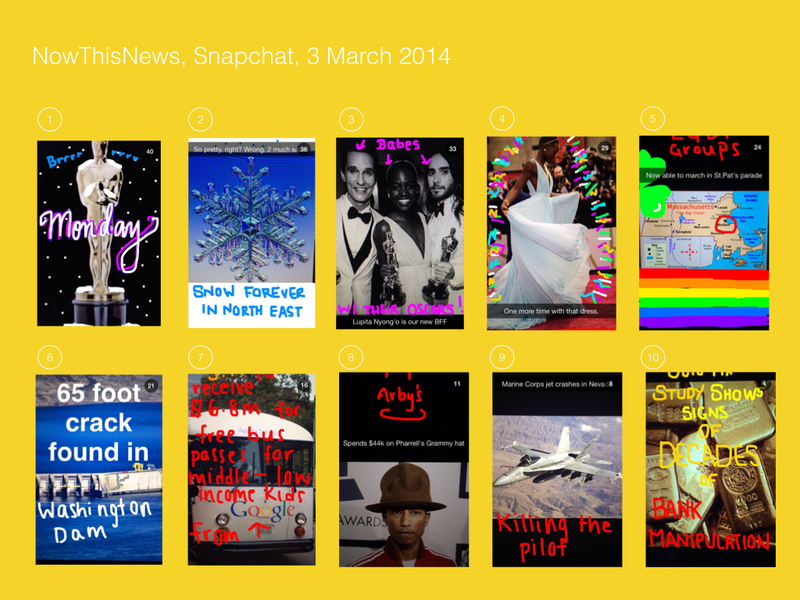 Where it gets interesting for media companies is Snapchat Stories, introduced late last year. I wrote about it in my review of 2013 and suggested it and other messaging services are going to be a growth area for media orgs. Snapchat stories stay on the platform for 24 hours and they’re visible to everyone following you. Each new snap you add to your story is included in the sequence of snaps that followers see. By the end of the 30-minute training session, working in groups everyone had learned about Snapchat, they were on the platform and had uploaded a snap. It’s such a straightforward platform. Moreover, after showing them some of the ways it’s currently being used (NowThisNews, Washington Post Politics, Mashable etc), the group were thinking about Snapchat as a really interesting storytelling platform even for hard news. It was the day after the Oscars, so naturally there is a lot of Oscar-related coverage. The entire sequence is 40 seconds long and aside from the Oscars (and Oscar-related news) it covers six other stories: a 65-foot crack in a Washington dam, the ongoing cold weather in the North East, the death of a US Marine Corps pilot in Nevada, a Gold Fix study on bank manipulation, Google’s plans to give free bus passes to San Francisco kids and a deal that enable LGBT groups being allowed to march in the Boston St Patrick’s Day parade. It’s the news, but delivered like Perez Hilton had a hand in it. There are drawbacks. You have to work for every Snapchat-er, this is not a viral platform. Also, if you’re not creating your Snapchat using the platform itself you’ll have a problem with screen sizes. I’ve screengrabbed the above images from an iPhone 4s, but I’d say they were made with a 5 (or larger screen) in mind. The most important thing with Snapchat is not to treat it as a lesser platform. It would be easy for news organisations to treat it more casually than some of their other channels, but NowThisNews and others have set the current benchmark for Snapchat as a storytelling platform. There is a lot more news organisations can do with the messaging app, especially if Snapchat enables users to create Stories with other tools or makes more complex tools available for news orgs and brands. There are also opportunities around audience-created content. In some ways this type of storytelling reminds me of scanning the headlines and photographs in a newspaper, I think we underestimated how much news we ‘absorbed’ scanning across a page. Snapchat is quite passive, all the user needs to do is hold a finger on the screen and watch, but unlike scanning a paper it’s a mobile messaging platform and it feels a lot more personal. If there is one personality trait you can count on when it comes to journalists it is competitiveness. This is something NewsWhip is capitalising on with its new service NewsWhip Creators, which puts journalists into a dynamic leader board based on the social activity the stories they have authored received. But Newswhip Creators is more than just an elaborate vanity contest, this a gift for managers who want to see quickly how their journalists are performing compared with rival organisations. Perhaps the bigger gift to managers is that it’s going to spur their journalists on to make their content more social. However journalists can only do so much, this leader board is also going to very quickly shine a big light on media orgs who are enabling their audiences to share and interact using social media and, perhaps more importantly, those lagging behind who are not. The task for Newswhip now is to localise this product and sell access, also I can see media organisations paying for access to custom builds of this (particular niches, landscapes etc). Mobile: We are all really in the attention game now! I was away last week in Santiago de Compostela attending the Circom Regional conference where I heard a lot about the different innovations European public service broadcasters are making in terms of their mobile output. Listening to the presentations got me thinking about something that hit me a while ago and about which I have been meaning to write – ATTENTION. As we move more and more to mobile, content makers are in an even fiercer battle for the users’ attention. It’s no longer just about competing against other content websites, ecommerce, email, social media etc. We are all really in the attention game now! Whether it’s making calls, texting, watching videos, emailing, gaming, reading books, banking, listening to music, browsing the web, IM’ing, social networking etc there is so much to occupy a smartphone user’s attention before they even contemplate checking a media org’s app or mobile website. Commenting on research released earlier this year the Harvard Business review pointed out that people spend only 47 minutes a month ‘seeking news or information’ only 4% of the overall time they spend on their smartphones. For a media org that’s a scary prospect and surely means you have to find ways to aggressively play the attention game. It’s time to work hard to get the user’s time and attention. Go social: incorporate social networking elements strongly into your offering. Give people ways to interact with each other. Encourage it, stimulate it, devote resources to it. Gamify: Learn from the games industry and introduce the concepts of competition and rewards. Personalise: Find ways to introduce as much personalisation as possible – location, interests, peer recommendation/referrals. Be useful: Place an emphasis on content that people really need – practical stuff that’s required every day. Prioritise this and build a core around it. Entertain: Use your mobile platform to grab some of that time where people just want fluff, eye candy, humour and distraction. We are not going to boost the amount of time the smartphone user spends on finding news or news discovery so we must push hard into the other areas that interest them more. It’s essential you are very clear about what you’re building when you are working on mobile platforms. Keep the audience in mind at all times and think of ways to disrupt their current behaviour and gain their attention – otherwise you’re just building follies! News organisations and the Facebook app – is it an equal relationship? I’m very positive about Facebook. I have been for a while now. Working for a news organisation I see how it can reach new audiences, help journalists to engage with users and drive web traffic back to base. In the past few weeks some of the world’s biggest news organisations have announced they’ve teamed up with Facebook to produce apps, which live within the social network’s walled garden. This has obvious advantages for Facebook, which gets to keep its users on its site for even longer. It might also, eventually, be a good deal too for the user who gets to read content without being diverted to a third-party site (especially useful on mobile devices!). But thinking about this long-term, if it gains traction and users like it, news organisations may dig themselves into a bit of a hole. What I can’t figure out here is how the news organisations are measuring success. Jump ahead a few years and assume the idea is massively successful, Facebook has become the place not only to find news but also to consume it, where is the benefit for the news organisation? People won’t need to come to news organisations’ websites for community either, they’ll have that on Facebook and (within reason) will be able to say more than they could on any news site in the world. At best, news organisations will gain new audience and advertising revenue but the audience will be loyal to a Facebook/news organisation partnership not to the news organisation itself. If for any reason the partnership were to break up, where would those readers go? In my opinion, if they have become accustomed to finding and consuming news within Facebook, it’s unlikely they’ll follow the news organisation out of the walled garden. To me it seems like a more unequal relationship than it should be. I understand that news organisations are working with a behemoth, but are we not jumping the gun and surrendering. Do we need to do this right now or can’t we maintain the fairly successful strategy of collaborating with Facebook to guide its users to our content outside the garden? I’m sure news organisations think these apps are targeted at users who currently don’t consume content on their websites, but if the existing tools of sharing and linking are not achieving this I am doubtful an app will be that much more successful and instead will likely attract their current audience. Perhaps I’m missing something (I know I haven’t discussed the new ‘read’ function etc, but while interesting, the greater value accrues to Facebook not the news organisation)? I am in favour of making news organisations as social as possible but within the context of building sustainable businesses. I would love to hear more from news organisations about the long-term gains for THEM in such a partnership and how they see this developing. A former journalist and presenter with Ireland’s public service broadcaster Raidió Teilifís Éireann, Mark Little is spearheading a new digital news initiative called Storyful. Due to launch this summer, we have already been given a glimpse of the type of offering we can expect from Storyful through its link-up earlier this year with RTE.ie for the Portraits of the Global Irish series. In a blog post today, Little outlines his vision for Storyful. I wanted to find a way to fish the useful stories about our lives from that unholy torrent of internet debris. He talks about ‘filter failure’ and how users have shifted away from personalised news towards searching to discover or find stories. What lies behind the shift from search to discovery is the emotional charge that comes with an unexpected find. You know that feeling, that distinct jolt, when you come across an image or idea in all the clutter that speaks to you. A word you hear bandied about a lot by news pioneers these days is serendipity. Expect to hear a lot more of it as we try and resolve ‘filter failure’. Little says the companies who guide their users to unexpected places are the ones who will survive. As I’ve mentioned here before there is a lot we can learn from existing platforms to help us with future ones like Google suggested with Fast Flip. Digital media companies have something to learn from newspapers in how they organise and categorise discovery. But the parallels with newspapers may end there as Little says we must also learn from the mistake made by ‘old’ media. We should model our solutions on how real people talk about information that matters to them. They don’t spend alloted times of the day discussing politics and sport. They don’t schedule gossip for half an hour in between a chat about money and a debate on the arts. Instead, they tell stories about many things, at the very same time. This is how they consume information relevant to their lives. This is how they will consume useful and relevant digital journalism. The ultimate responsibility for discovering useful information now lies in the hands of real people not appointed gatekeepers. Journalists will ultimately lose control over the flow, direction and timing of the news. Instead, they will guide their communities on a voyage of discovery and curate the stories that resonate along the way. Some of that sounds similar to work being done out in Honolulu by former Rocky Mountain News’ editor/publisher John Temple (backed by Ebay founder Pierre Omidyar) with Civil Beat (see my post from the weekend), except that project is more locally focused than I think we can expect from Storyful. It’s an interesting blog post from Little – sounds like it could be the Storyful manifesto? The one missing thing is revenue – where is it going to come from? The Irish Times is offering a free trial of its newspaper via e-paper. A yearly subscription to read the publication through this service costs E89, shorter subscription models are also available. The free-trial period lasts until 24 March, according to IT journalist Shane Hegarty. Personally I am not a huge fan of e-paper, mostly because of the navigation. I do use it when I need to, but couldn’t imagine consuming news in this manner on a regular basis. However, I think it will find an audience with the Irish diaspora. While reading a newspaper on a website is great, I can imagine some miss seeing how the paper looks, reading stories in the order that they were placed etc. The Irish Times has been on e-paper, via pressdisplay.com, for a while now and its archive stretches back to May 2004. I wonder what has prompted the free trial offer? In other IT-related news, Deputy Managing Director Liam Kavanagh has been appointed Managing Director taking over from Maeve Donovan who announced her retirement last month. Tomorrow RTÉ.ie presents a special series about technology in the developing world. Joe Zefran, RTÉ.ie News Editor and I have put the cross-media series together. Joe traveled to India and I went to Rwanda and Kenya where we reported and shot our own video for three reports on three programmes, including the Irish charity Camara, which are using three different approaches to reach the same goal: educating the world’s youngest citizens. The series looks at how children in the slums of New Delhi are linked to the larger world, how one experiment wants to make sure every child in the world has their own laptop, and how an Irish charity is changing the lives of people in Kenya. There will be full-length text features and web-exclusive interviews on RTÉ.ie/globalclassroom. Plus, for the first time at RTÉ, RTÉ.ie will produce a three-part television series that will air on the Six One News and News on Two. My reports will air on Monday and Wednesday and they focus on Camara and One Laptop Per Child. This has been a very exciting project and I look forward to doing more like it in the future.